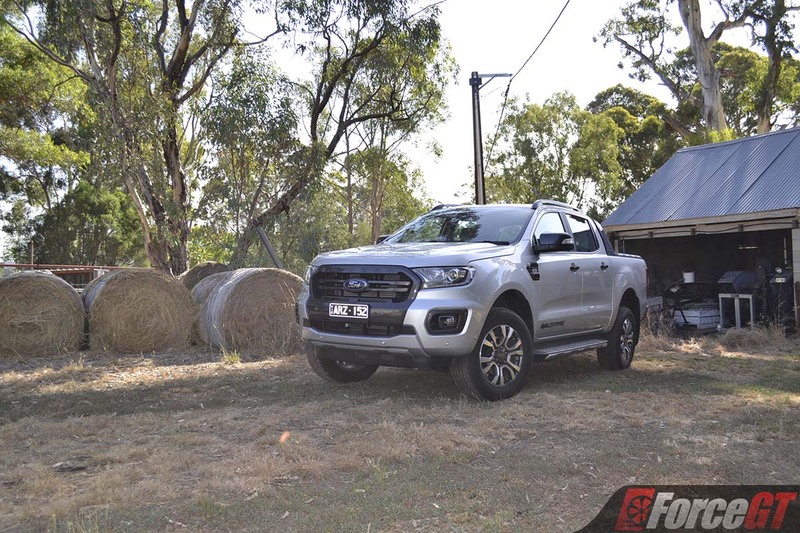 The Ford Ranger is now the second most popular vehicle in Australia behind its archrival the Toyota Hilux, usurping passenger cars like the Mazda3 and Toyota Corolla for podium position. 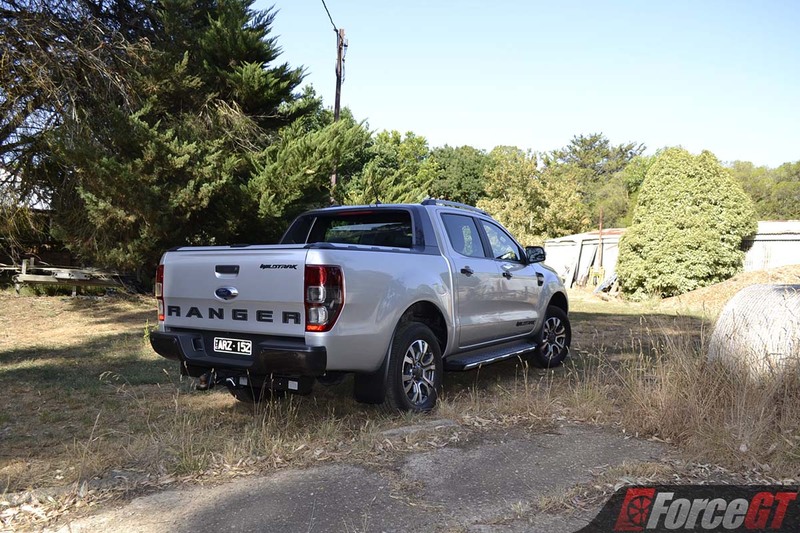 Engineered in Australia and launched in 2011, the Thai-built Ranger has cement itself not only as a favourite amongst cashed up tradies, but also private buyers wanting a lifestyle vehicle. 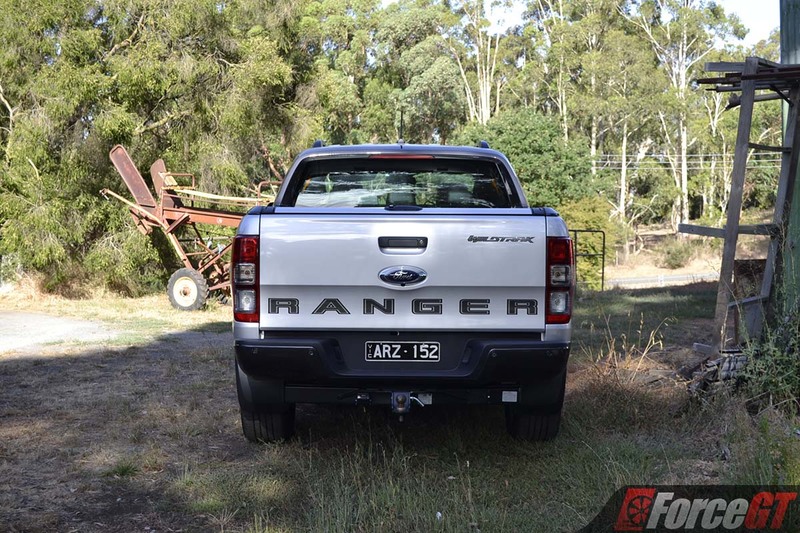 So when it comes to updating the 2019 Ranger line-up, Ford has treaded cautiously; instead of messing with a winning formula, the company has updated the MY19 Ranger with key mechanical and safety upgrades with barely a change to the reworked Ranger’s outlook. Pricing has remained relatively unchanged, too, across the range starting at $27,990 (up $100) for the XL cab chassis 4×2 manual. At the other end of the scale, our double-cab 4×4 Wildtrak test car – a favourite amongst private buyers – features a 3.2-litre five-cylinder turbo-diesel and 6-speed auto that comes in at $62,790, representing an increase of $1,000. 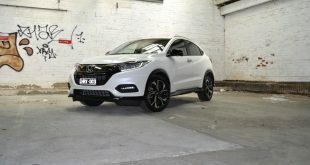 All stickers are before on-road costs. To justify the higher entry price, most variants pick up extra specification over their respective outgoing model. The Ranger line up is extensive. 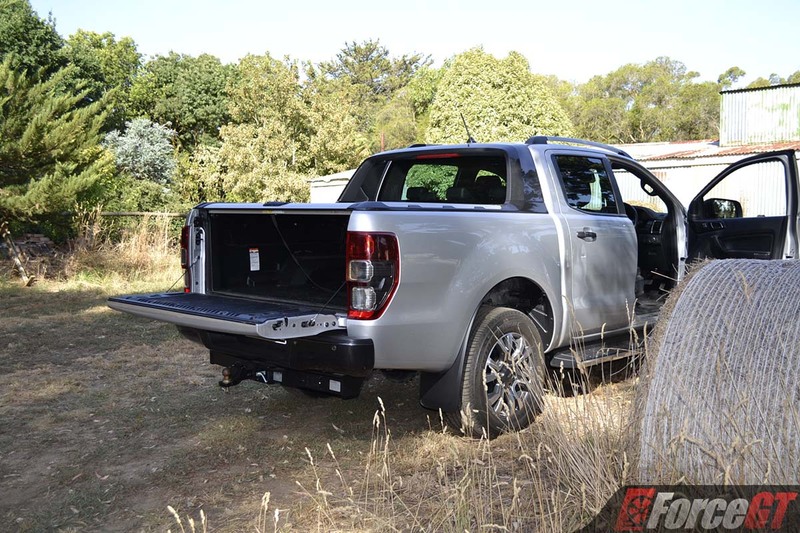 There are no less than 29 variants within the range spanning cab-chassis, single-cab, dual-cab and super-cab across four grades. 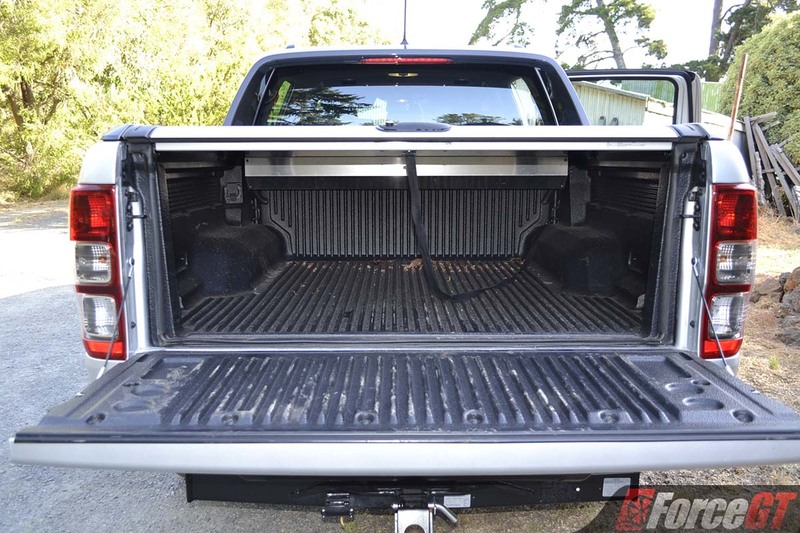 It’s also offered with 4×2 and 4×4 drivetrains. 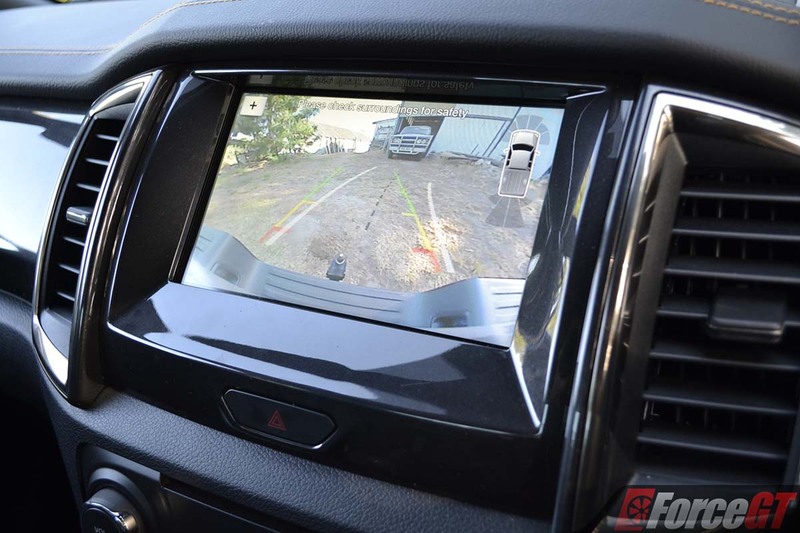 All MY19 Rangers benefit from revised suspension setup to reduce body roll and improve the driving experience when fully-laden and towing, while 4×4 variants are equipped with an electronic differential lock. 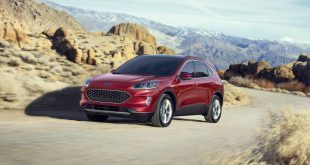 The only variant to miss out on the e-diff is the base XL 4×2 RWD. 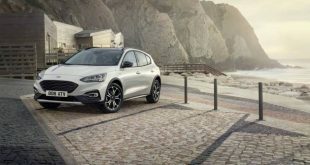 On the safety front, all models get hill descent control, hill start assist and dynamic stability control. Ford’s Pre-Collision Assist encompassing Inter-Urban Autonomous Emergency Braking (AEB) with Vehicle Detection and Pedestrian also makes its debut on the updated Ranger – one of only a few in the class with the feature, the other being the Mercedes-Benz X-Class and recently launched Mitsubishi Triton. 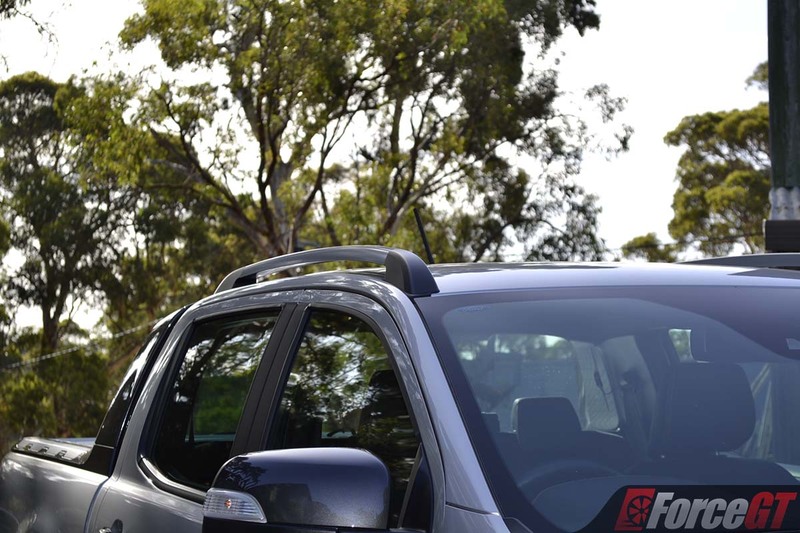 The system is capable of bringing the Ranger to a complete stop if it detects pedestrians or vehicles ahead and works at speeds above 3.6km/h. 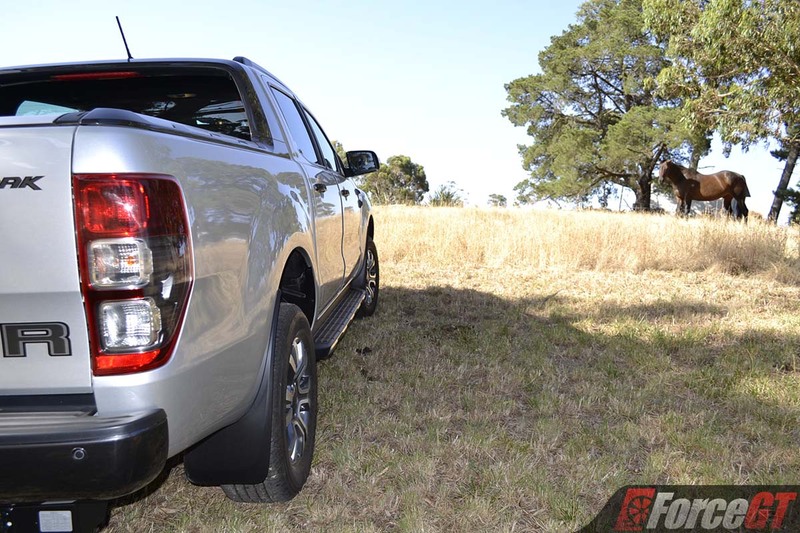 Lane Keeping Aid with Driver Alert System, Traffic Sign Recognition and Auto High Beam are also now standard on every Ranger ute. 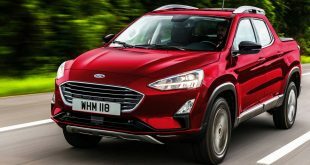 In a sign of its changing audience, the upmarket Wildtrak model adds Lane Departure Warning and Adaptive Cruise Control to its ever-expanding car-like equipment list. 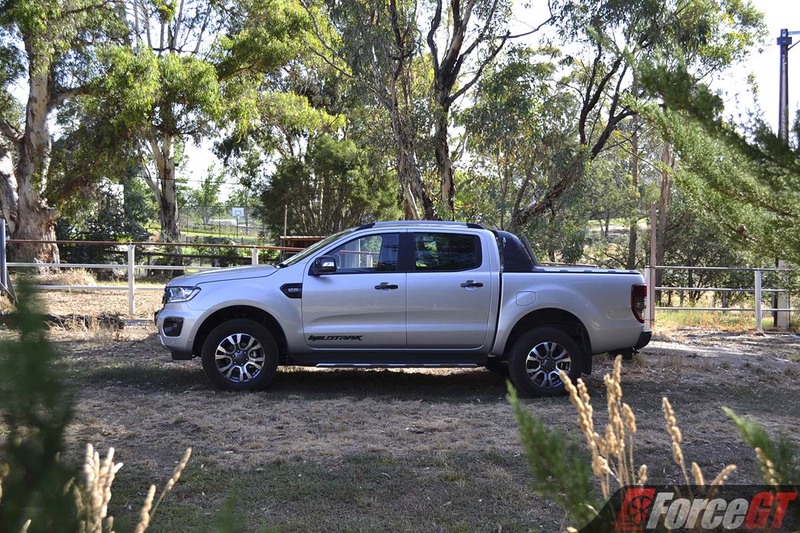 And in a first for a Ute, the Wildtrak and XLT now comes with automatic park assist that takes the stress out of parallel parking by steering the car into the parking space automatically while the driver controls the throttle and brake. Another new feature descending on the MY19 Ranger is the easy-lift tailgate on all pick-up models. 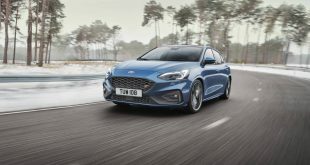 It’s now lighter to lift, with a 70 per cent reduction in initial force required to raise it for closing. 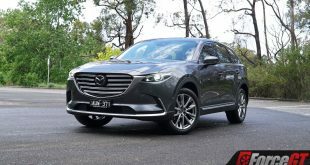 What’s new about its design? 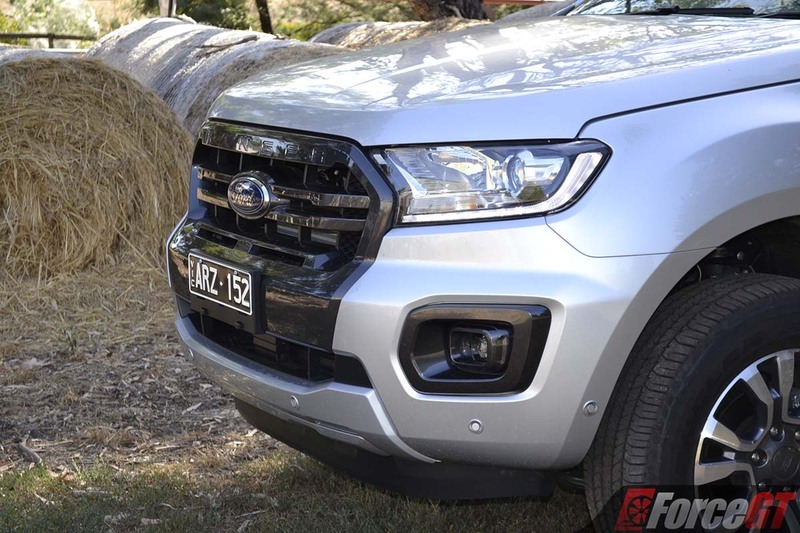 There’s a new front bumper on the Wildtrak… and that’s about it. 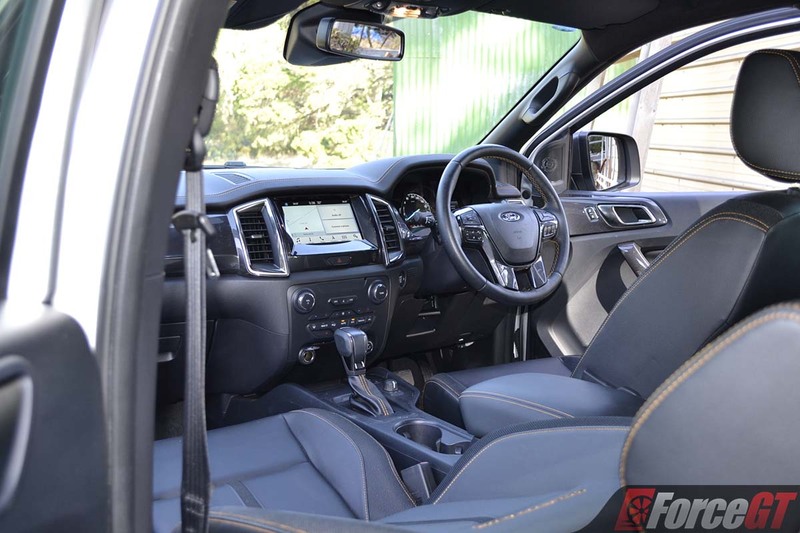 Inside, the Ranger’s interior now sports a black theme, with the Wildtrak also featuring a black headlining for a sportier feel. 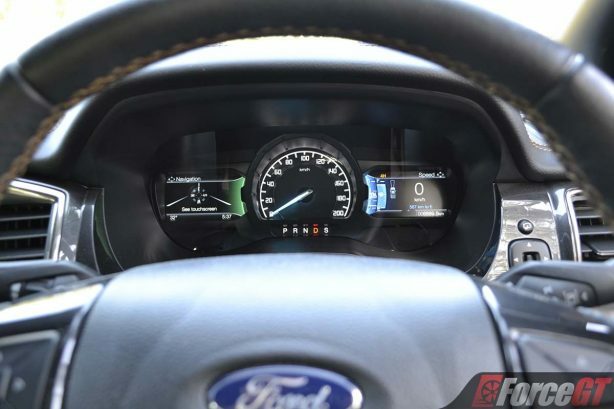 While the dashboard remains unchanged, some of the finishes have been upgraded for better tactility and durability. 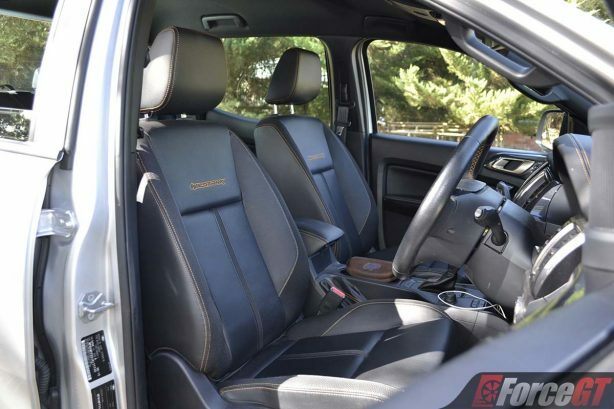 The man-made leather on our Wildtrak not only looks good but also appears relatively hard-wearing. 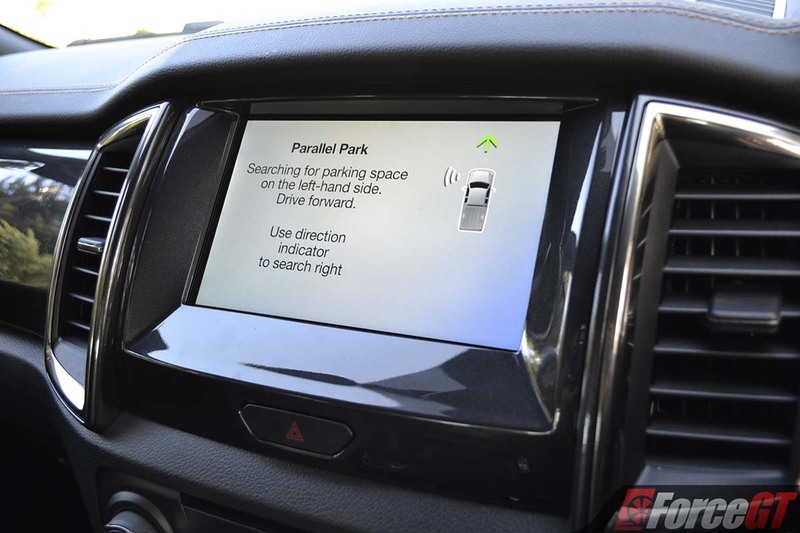 Like the rest of Ford’s current line-up, the Ranger features blue-oval’s SYNC infotainment system with a 4.2-inch colour display. 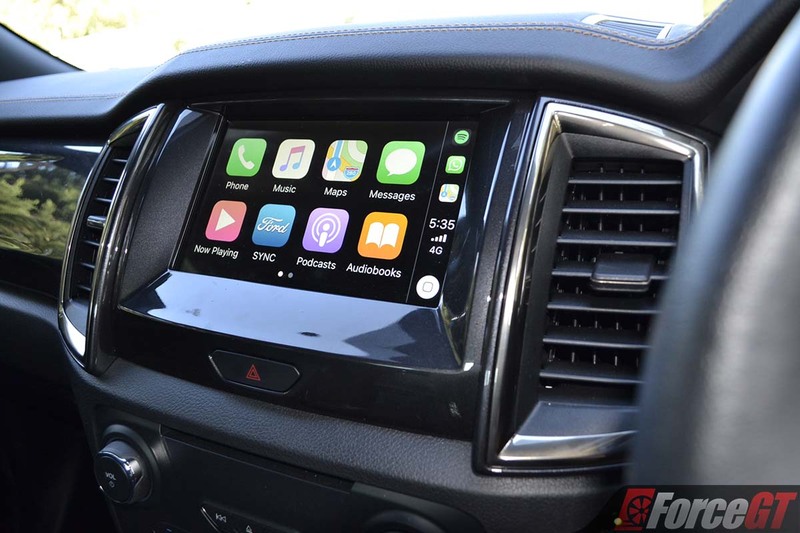 XLT and Wildtrak models get the latest SYNC 3 system with a larger 8.0-inch touch screen with Apple CarPlay and Android Auto functionality, as well as built-in sat-nav. 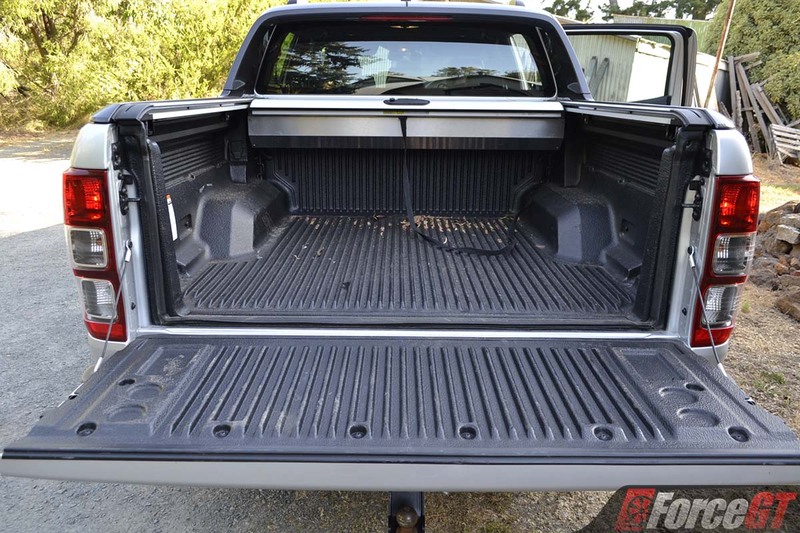 All variants bar the XL cab-chassis models (4 speakers) come with a 6 speakers sound system. Digital radio is also standard on all models except for the entry-level variant. 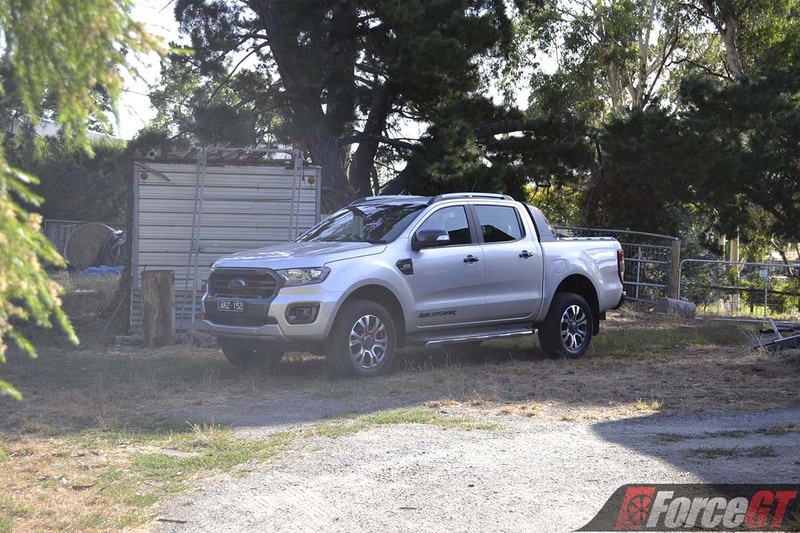 There’s plenty of room in the five-seat, dual-cab Ranger we are testing here. 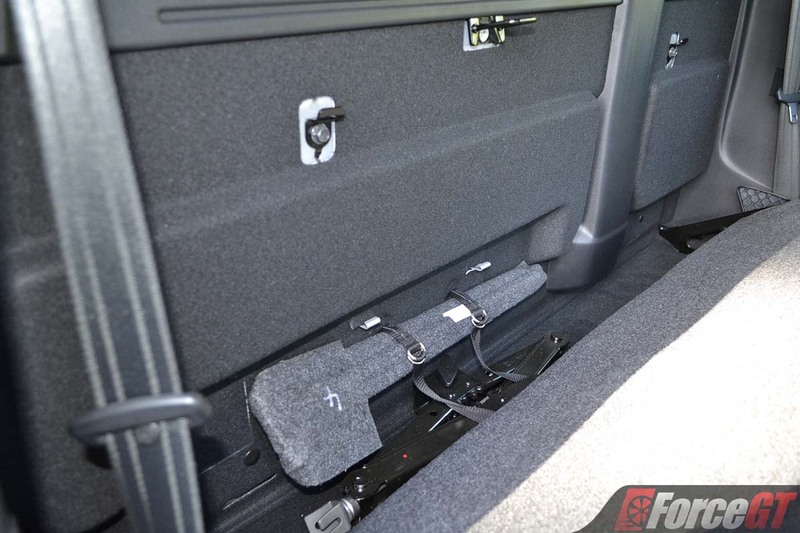 The front seats (8-way electric adjustment for driver) are wide and relatively supportive, while legroom is good. It’s a similar story in the second row with good head and legroom for most but the lankiest. 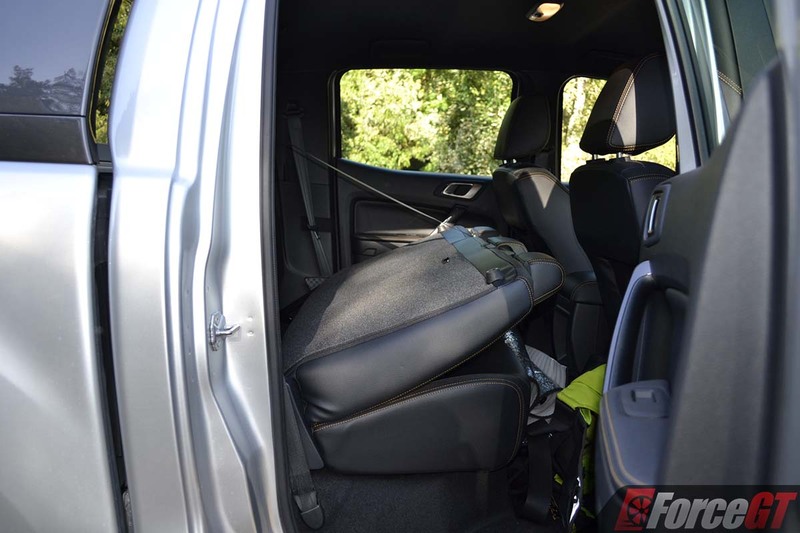 Unlike some rivals, the Ranger’s rear seat backrest isn’t too vertical, making it more comfortable for rear seat passengers. There are also ISOFIX mounts for two baby seats on the second row. 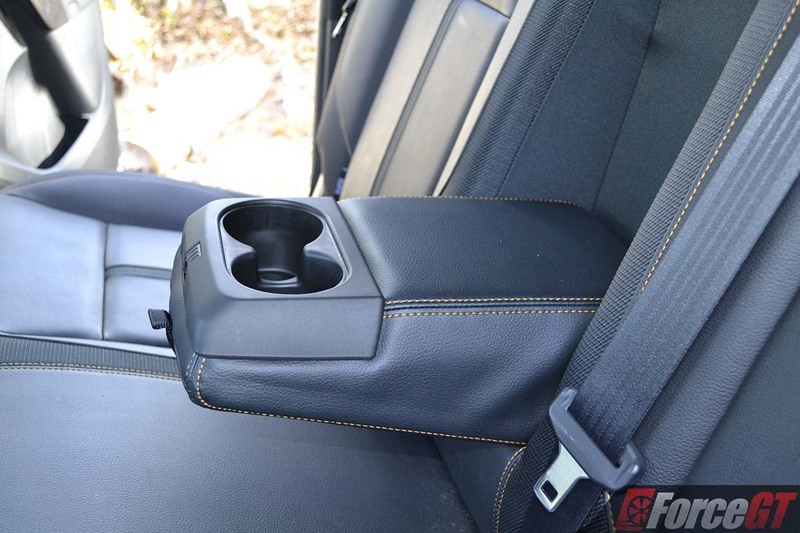 In terms of storage, there is a deep centre console bin along with an oddments tray underneath, cup holders front and back, and bottle holders in all doors. Modern portable appliances will gravitate towards the two USB ports under the climate control in the centre console, while rear seat passengers will scramble for the sole USB port available. Tradies will be happy to find a 12-volt socket up front and another at the back next to a 230V universal plug. A further 12-volt socket can also be found in the tray to cover all bases. 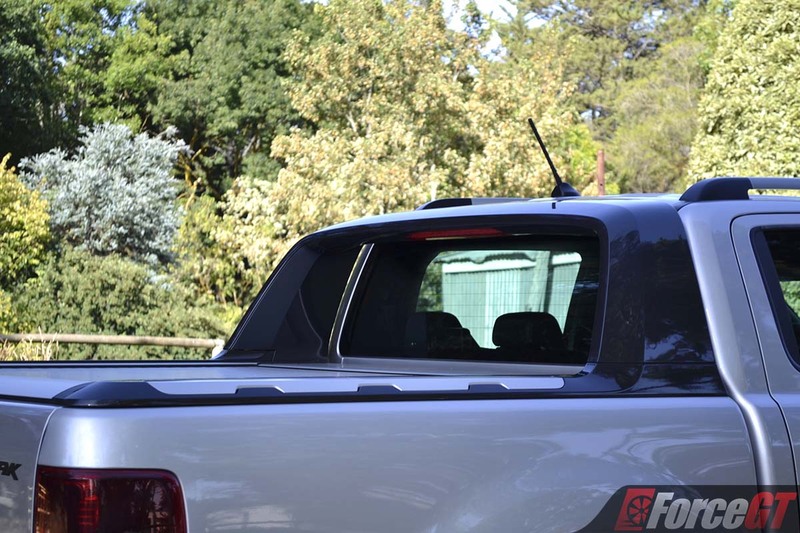 When it comes to load capacity, the Ranger Wildtrak’s loading tray measures 1,549mm long and 1,560 wide (or 1,139mm if measured between the wheel arches), and is rated for a 940kg payload. Towing capacity comes in at 3,500kg braked, and 750kg unbraked. Our Wildtrak comes with the tried and tested 3.2-litre 5-cylinder turbo-diesel engine which isn’t as fruity as the new 2.0-litre turbo-diesel setup. 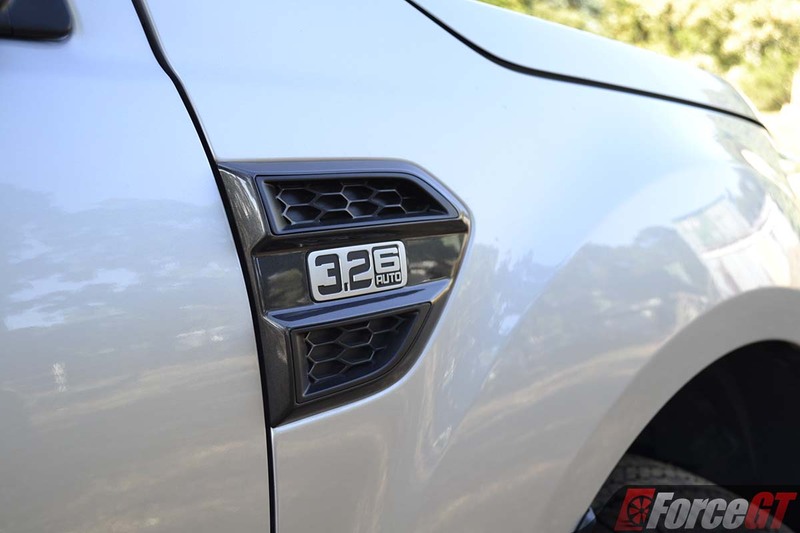 Nevertheless, with 147kW at 3,000rpm and a still beefy 470Nm at 1,750-2,500rpm, the Wildtrak is relatively effortless. It pulls strongly from the get go and build up speed without much stress. It’s sounds relatively good to for a diesel and engine refinement is up there with some of the best diesel engines around. 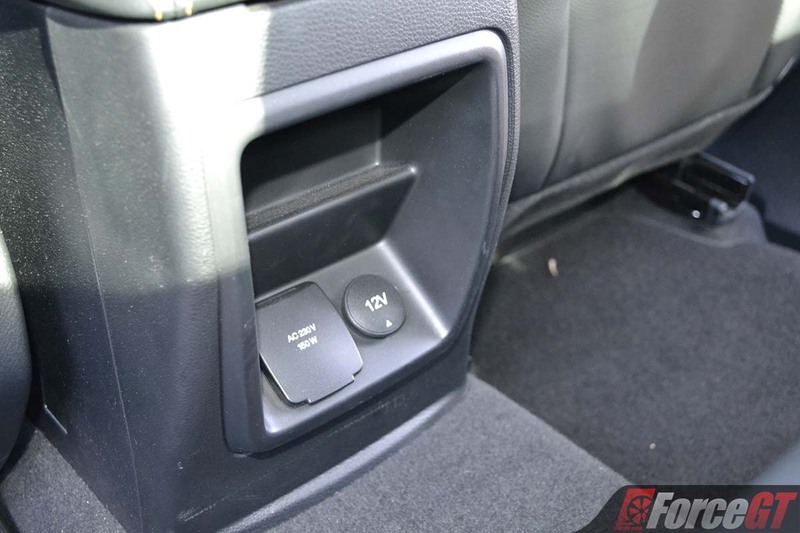 The 6-speed automatic shifts smoothly and is well programmed, dropping gears diligently as you approach a corner. 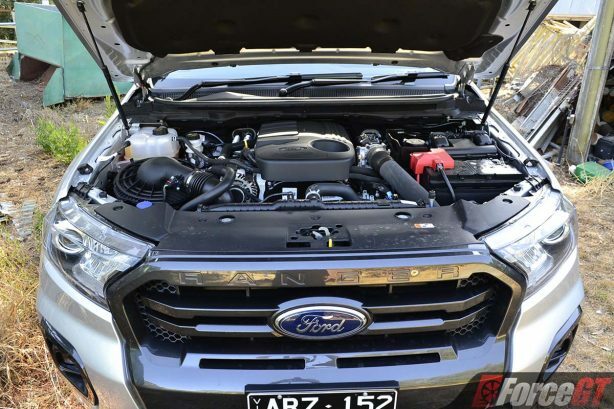 Ford claims the Wildtrak would return 8.9L/100km on the combined cycle. Our 400km test saw the trip computer figures hovering at around 11.1L/100km. Surprisingly car-like, although you are constantly aware of its heft. 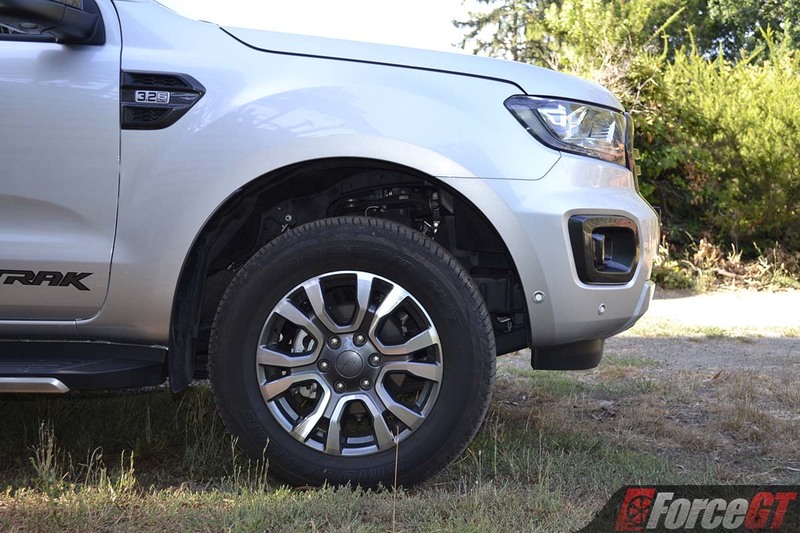 The Wildtrak’s retuned suspension soaks up road undulation relatively well around town, given it’s rolling on 18-inch wheels. It’s still a bit bouncy and unsettled on less than perfect bitumen without a load but that’s a common trait amongst full-sized utes. On a twisty road, it remains fairly composed, with an acceptable amount of body roll as expected for such a tall vehicle. It’s steering is not overly heavy which makes it easy to manoeuvre around town and in carparks, but not its ponderous 12.7m turning circle. 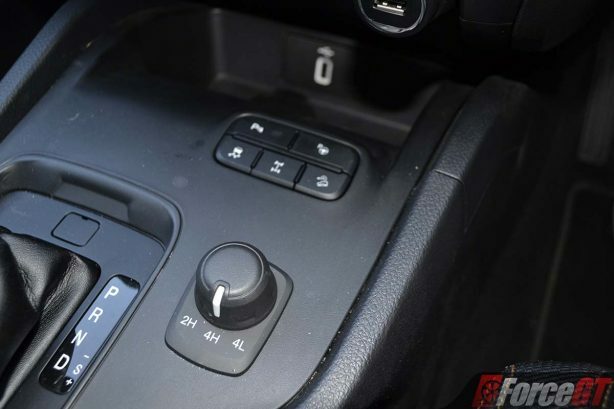 The Ranger’s steering is also light on feel and requires extra effort to keep it in its line. 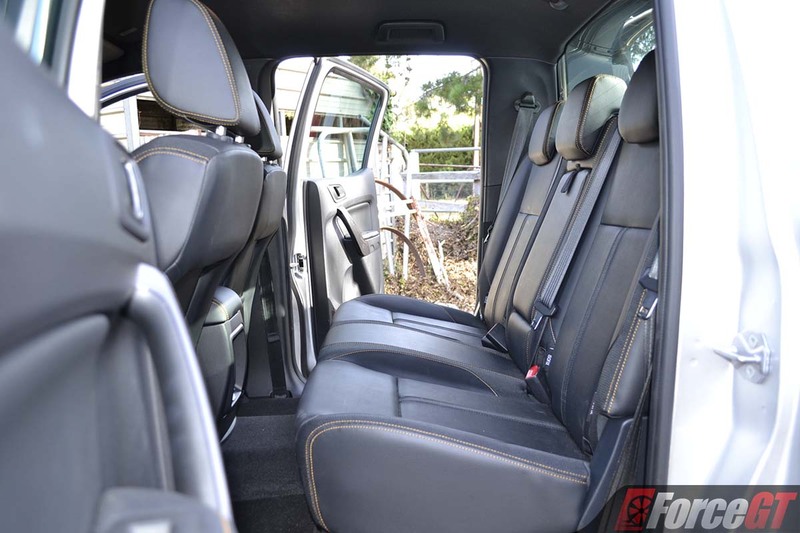 Cabin refinement is excellent too for a commercial vehicle, with the cabin hushed enough for a decent conversation without having to strain your vocals. 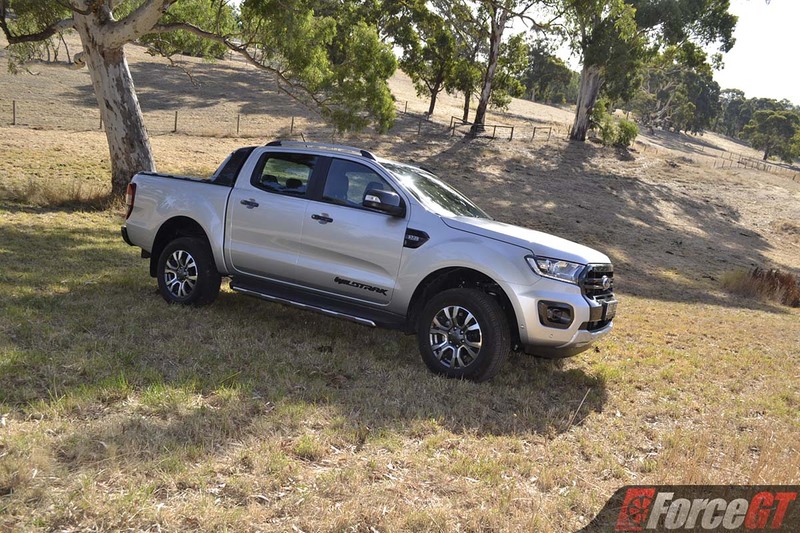 I didn’t put the Wildtrak through enough dirt work to warrant an off-road review (except for a bit of cross-country) but its dual-range four-wheel drive smarts are well documented, including a wading depth of 800mm and solid 237mm ground clearance. 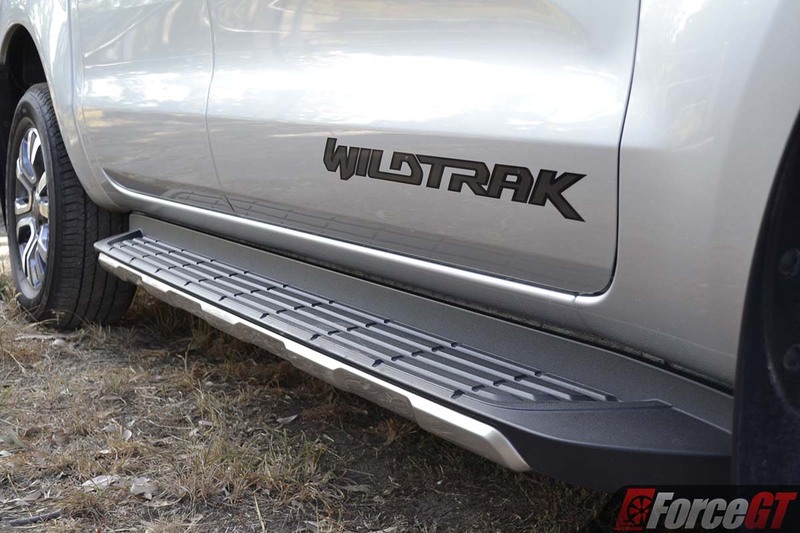 Its 29 degree approach angle and 25 degree breakover angle also means the Wildtrak can easily tackle most terrains with ease. Will it be expensive to maintain? All new Fords now come with a 5-year/unlimited kilometer warranty, including its commercial vehicles like the Ranger. 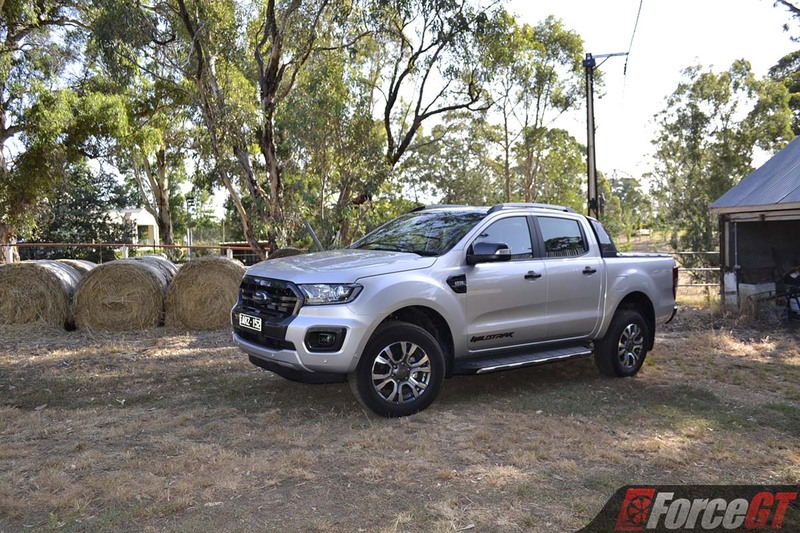 Servicing the 3.2-litre dual cab 4×4 Ranger will cost around $2,470 over five years, with service intervals at every 12 months or 15,000km, whichever comes first. 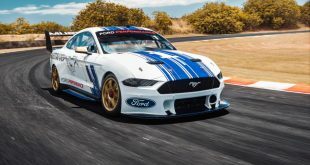 Do bear in mind however things like brake fluid, differential oil and transfer case oil are all additional and is dependent on how you use your car. 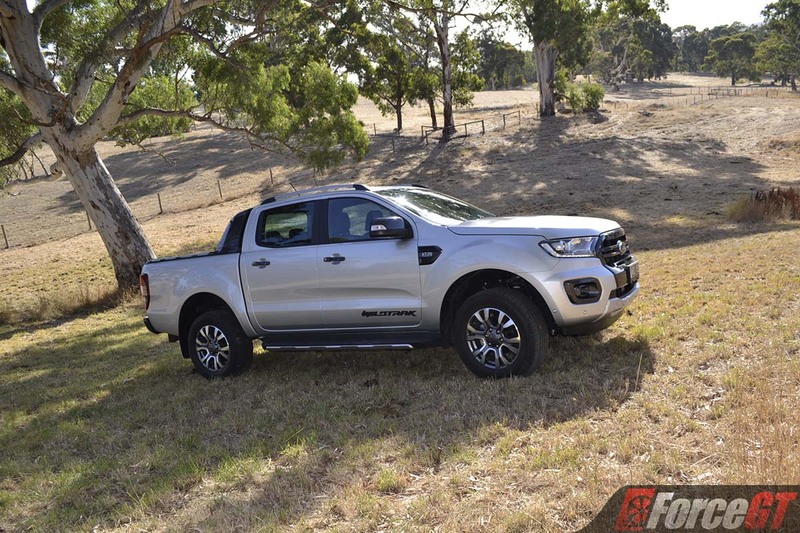 The safety and technology upgrades will no doubt keep the MY19 Ford Ranger at the front of the pack. 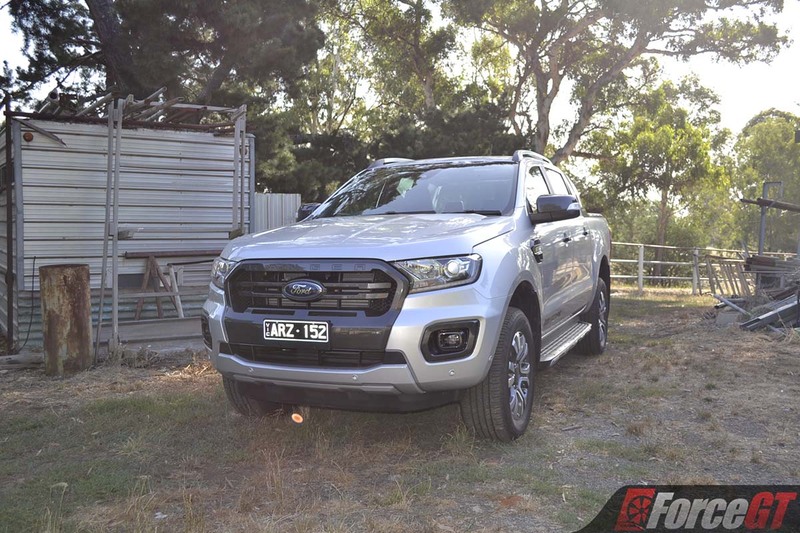 Coupled with its almost car-like drive experience, versatility and generous equipment in top-spec Wildtrak, it’s easy to see why. However, with fresher offerings like the bold Mitsubishi Triton coming on stream, will the carry over sheet metal be enough for the Ranger to defend its patch?